Now this is some innovation – it's a watch – it's a perfume – it's a watch that has perfume in it. Available from Piccolina, the Venexx watch actually comes with a little funnel to allow you to add your own perfume. Then you push a button to sprits it on you and you are good to go. A watch case with a tiny tank that can hold your choice of perfume (approximately 60 dosages). The perfume may be changed very easily with the accompanying funnel. Stainless steel watch case with turnable bezel. Diameter 39mm, scratch-resistant mineral glass. Genuine interchangeable Italian leather strap in croc-look. Swiss movement Ronda Cal. 1063.1.90 (Hour, Minute, Second). A stylish aluminum box specifically designed to hold the Venexx watch, the funnel, the pipette and the sample Venexx perfume. Actually, I don't know if Johnny Depp has anything to do with the new line of jewelry Disney is coming out with other than the fact he starred in the movie that inspired the creation of the jewelry, but it gives me an excuse to post this hot picture of him. And, I'll take any excuse I can get. This one is from Wallpaperbase.com. Johnny aside, there really is a jewelry point to this post. Walt Disney Pictures' "Pirates of the Caribbean: Dead Man's Chest" hits theaters July 7, and luxe choices will complement the movie – such as T-shirts and plastic lunch boxes – and will be sold at Disney's 525 company stores around the world. Disney Couture Jewelry and Judith Leiber will launch accessories inspired by the sequel to "Pirates of the Caribbean" that use materials such as gold and Swarovski crystals. The introduction is part of a wider effort by Disney Consumer Products, the branding division of Walt Disney Co. responsible for its apparel, footwear and accessories, to target goods to a more high-end, fashion-forward audience. I made a trip to Judith Leiber's web site in hopes of finding some of the jewelry, but I didn't see any specific mention of this new jewelry collection. I guess it could be a little early. Still, I liked the other jewelry and accessories she has on her site including some crystal beaded purses. This beautiful sterling silver bracelet is elegant with its collection of detachable charms ranging from a cute hand bag to a beautiful Austrian crystal. Sterling Silver Heart choker Length 16" Charm 1" x 1"
An elegant style with perfectly set hand glued Austrian crystals adds the finishing touch to this bag. Mangrove Minaudiere. Fully beaded multi colored Austrian crystals with silver accents. Dog Tag Necklace. This necklace is elegant in many ways with its sterling silver back piece, featured with a leather background and an exquisite hand glued Austrian crystal at center. LIKE JEWELRY FOR MY SHOULDERS! Get all the attention with these fabulous Swarovski crystal jewelry bra straps. With all the glitz and glamour in your shoulders to enhance any of your outfits. Choose from single, double and four row. Also available in oval and crystal pattern. Elegant jewelry box and pouch included. Hypoallergenic nickel free silver jewelry. Wide:1/8", Total Length:17.7" (including 4" adjuster chain). Part of me says, "Great more jewelry to wear." Plus with companies like Victoria Secrets obviously lingerie is a big deal right now. I'm not sure. Personally, I'm still of the old school where it's a no-no to show your underwear off. I just can't go there, you know? I will say it could be the perfect gift for the female friend who has everything. Next to your Engagement ring, anniversary rings are the next big jewelry notch on the belt. I have to confess of thinking about my future anniversary ring only a few short months after getting married. Jewelry Exchange, one of the world's leading jewelry manufacturers and direct diamond importers, unveiled a new series of anniversary rings, designed by their in-house artisans. 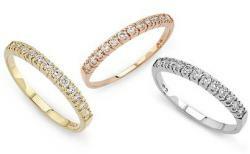 The rings feature 12 full-cut diamonds and are available in stunning white, yellow or rose gold. Called the "IMYA" rings, which stands for "I'd Marry You Again," they are priced at just $99. How weird that I would stumble upon these beaded cell phone chains or Tech Tethers as they are called by The Latest Trend web site. I'm going to have to carry my cell phone around with me everywhere for the next few days due to an ill cat. Normally, I'm just not that interested in my cell phone. In fact, I often leave it turned off in my purse and I turn off the ringer on my home phone because I hate getting interrupted by sales people trying to sell me a water softener. But, I need to be on call for the kitty in case the vet calls me, so I'm lugging this darn thing around for the next few days. I'm not sure if I'd like to wear it around my neck, but I like the idea of connecting it to my purse. Not all purses, especially older ones, have enough pockets for cell phones and all the other items we need ready access to. Another clever addition to these beaded chains is that you can wear them simply as a necklace, sans the phone. Have a lot to cover today – so I'll get to it. As usual, feel free to add your own links in the comments. Style Bytes says crosses are back and hints that maybe styles from the 90s are making a come back as well. Brown 712 displays a pair of silver and green earrings with a nice, sleek design. Budget Diva recently stumbled upon a, get this, "mouth" necklace. Bunny Shop gives some fashion advice for anyone lucky enough to travel this summer. Chic Alert has news about the Eden Dawn collection. Fashion Tribes shows us some gold fossil earrings made of ammonite. Guise tells us about selling journals that sell one-of-a-kind jewelry pieces. Jewelry and Beading talks about making jewelry from felt. Le Femme exhibits some fairy tale earrings. Papier Doll reports on doing the 80s yet again. I caught part of the Honora Pearl show on QVC the other night. I had forgotten what great pearl jewelry they have and how reasonably priced most of it is. Honora also tends to pay attention to jewelry industry trends. So, you can find anything from a classic pearl knotted necklace to a leather, silver, and pearl bracelet to a pair of silver and pearl hoop earrings. I spend a little time on their web site and along with some interesting pearl facts, they have a nice slide show about pearl farming. 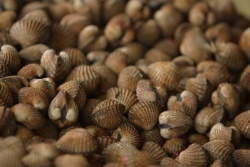 These days the majority of pearls are farmed, just like fish or potatoes are farmed. This is one reason prices have come down over the past few years. You can find loads of Honora pearl jewelry to drool over both at the Honora web site as well as QVC's site. Here are few pick for you. Courtorture has become more jewelry and accessory friendly with a new break down on their site. To help jewelry lovers and accessory addicts locate the latest blog news, they have created a special category just for us. Along with a new look they are announcing some new give aways. From Editor and Cheif, julie Fredrickson: Check it out! We've got channels ( http://www.coutorture.com/) and communities (http://www.coutorture.com/community)! Now that we have 116 (and growing) fantastic Coutorture partners in the community Phil and I felt it was time to break things down into communities so that it is easier to find the bloggers and topics that interest you. To celebrate we plan to do a series of fantastic giveaways specific to each channel. So for each channel we will be doing a giveaway specific to interests in each channel. If you've read this blog for, what?, three minutes than you know what I thing I have for pearls. 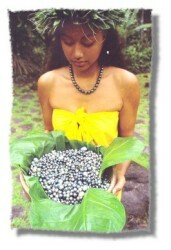 Black pearls, especially, have a mysterious quality to them. I recently discovered Black Moon Pearls. Along with lots and lots of beautiful pearl jewelry (I've picked a few pieces below), they have some wonderful information on the history, care, grading, and types of black pearls. Double Strand 8X9MM – 9X11MM Dark Gray Tahitian Pearl Bracelet 14K Clasp 7.5 in.